Skills required: Casting on, knitting, purling, increasing, decreasing, knitting in the round, yarn over, working a stitch pattern using elongated stitches (explanations/link to video tutorial provided), binding off..
Construction: This garment is knit seamlessly from the top down, with the button bands worked as you go. The yoke is worked flat using raglan increases then sleeves stitches are put on hold while the body of the cardigan is worked in one piece. The ¾ length sleeve stitches are then worked in the round. As sweet as a whimsical children’s song, this little cardigan is the prefect addition to a little girl’s wardrobe. 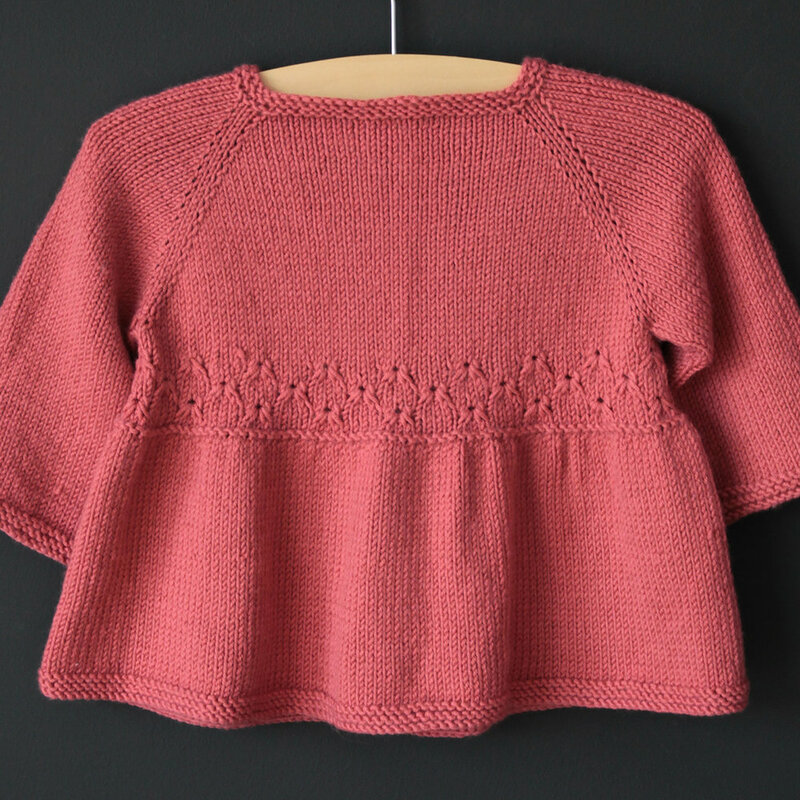 Straightforward to knit with its top-down construction and pretty stitch pattern, it features lovely details such as the subtle flare at the top of the 3/4 sleeves, which echoes the overall swingy shape. Garment chest at underarms: 17.5 (19, 20.25, 21.5 // 22.75, 25, 27.5, 30) inches or 44.5 (48, 51.5, 54.5 // 58, 63.5, 70, 76) cm. Approximately 300 (350, 400, 450 // 500, 600, 700, 800) yds or 274 (320, 366, 411 // 457, 549, 640, 731) meters of Debbie Bliss Baby Cashmerino 55% Wool, 33% Microfiber, 12% Cashmere ; 137yd/125m per 50g/1.76oz ball or similar sport weight yarn. 24 sts x 32 rows = 4 inches or 10cm in stockinette stitch after blocking using larger needles. 26 sts x 38 rows = 4 inches or 10cm in embroidery stitch after blocking using larger needles. US 4 or 3.5 mm circular needle (or size needed to match stockinette stitch gauge). US 3 or 3.25 mm circular needle (or one size smaller than needles used to match stockinette gauge). matching set of double pointed needle.